Service dogs are ones that are trained to help individuals with challenges perform tasks that are directly related to their disability. While in canine school, these animals learn how to execute many jobs. They made the grade to get into the doggie classroom because they exhibited three general characteristics: trainability, gentleness and a never-say-die disposition when it comes to work. More specifically, these dogs are intelligent, in control of their energy and aggression, and focus on their partner’s cues and commands. Under the Americans With Disabilities Act, service animals, unlike emotional support or therapy animals, have access to stores, restaurants, government buildings, and other public places. Only their size limits where they can go. Think Great Danes and Saint Bernards. These faithful companions are categorized by the disability their services target. Though no one breed has a lock on being the most useful, labrador retrievers and golden retrievers are very versatile and at the top of many lists. Here’s a look at some different types of service dogs and how the skills of some dogs are used. Also called mobility assistance dogs, this category of four-legged partner makes life easier for people who have trouble walking and standing. These canines help people who use wheelchairs, scooters, crutches, and prosthetics. Mobility assistance dogs help people with cerebral palsy, spinal bifida and multiple sclerosis. They also assist people who have migraines, fibromyalgia, high levels of chronic pain, and dizziness. They help their partners get back in their wheelchair or bed after a fall. They can pick up keys, push doorbells and elevator buttons, and help their partners transact business at banks and others places. Labrador retrievers and golden retrievers often do this work. Note that the standard poodle, smooth collie, Samoyed, Irish setter, and other individual dogs of specific breeds or mixtures can handle the job too. The animal just has to have the right qualities. Generally, physical assistance dogs weigh at least 40 pounds. Easily identified by the general public, guide dogs help the blind and visually impaired navigate through their world. These animals have been a presence in the U.S. since the 1920s. Hearing dogs aid the deaf and nearly deaf by alerting them and leading them to common sounds such as doorbells, whistling tea kettles, ringing telephones and their name being called. On the street, these canines continue to be keenly aware of sounds. Their partners watch their reactions so they will know which situations require undivided attention. German shepherds, labradors, golden retrievers, miniature poodles, Pomeranians, cocker spaniels and cockapoos make good hearing dogs. Terrier mixes are also good because they are alert and active. The sense of smell in these four-legged mammals is much better developed than it is in humans. A diabetic alert dog, therefore, knows when the blood sugar level of its partner is about to drop dangerously low. As hypoglycemia begins, the dog detects an odor, usually from the person’s breath. The animals signal their partners of an impending seizure by jumping on or pawing their lap, touching their nose, or fetching a toy and holding it in their mouth. They can also bring them medication and contact 911 on a special device. If not treated in a timely manner, low blood sugar could trigger a seizure, blackout, or coma. Dogs with longer and wider noses are very effective in this work. Breeds that are frequently used for diabetics include the labrador retriever, golden retriever, Shetland sheepdog, poodle, corgi, and Australian shepherd. Some people with epilepsy use a dog to assist them during and after a seizure. These dogs can warn their partners of an impending seizure an hour or more before it happens. By giving them time to find a safe place, these canines help people prone to this medical emergency to avoid serious injury. Researchers are not certain how these canines know a seizure is on the horizon. They suggest, however, that they could really be in tune with their partners or that their keen sense of smell detects something is different. Dogs have an array of ways to communicate with the people they work with. They might stare their partner in the eye, pace, circle, lick, or become agitated. Part of their work is retrieving phones or medication and staying with their partner. Service dogs help people with Post-traumatic Stress Disorder. Veterans immediately come to mind, but anyone who has suffered physical, emotional or sexual abuse or experienced a terrifying event could develop this disorder. 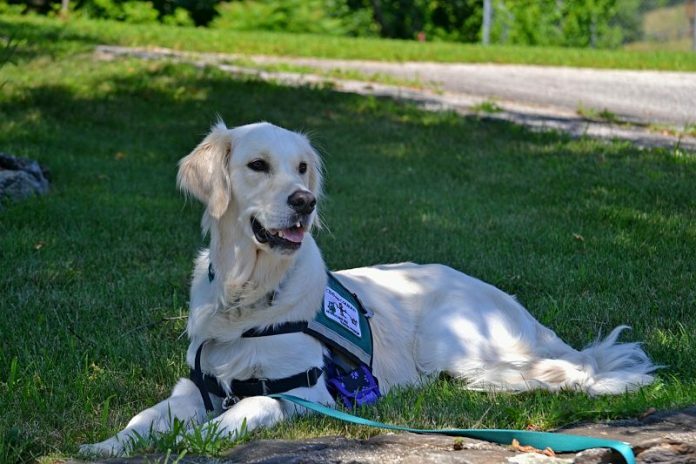 These psychiatric service dogs lessen the symptoms of PSTD such as hypervigilance. Their human partners will not have to nervously look around their environment. The canine companion will be their eyes and ears, alerting them, for example, when someone is approaching from behind. PTSD service dogs give their partners a sense of security and can help calm them in stressful situations. When the person they serve is away from home, the canine can keep strangers from getting too close because many people with PTSD don’t like crowds. If their partners exhibit negative behavior, the dogs can nudge, paw, or lean on them to try to stop it. They are also trained to fetch their medication and wake them up from night terrors. When a panic attack happens, the dog can lead its partner to the exit of a building, if necessary. These dogs help people make sense of simultaneous events. If music is playing before a fire alarm goes off, for example, these animals alert their partner that the sounding alarm is more important and that a response is required. In other words, these canine partners help children and adults get oriented and re-oriented to their environment. They help them to make sense of the many stimuli they encounter. But when partners remain overwhelmed, they can signal to their dog to guide them away from the overstimulating environment. These canines can communicate to their partners that they’re engaging in repetitive behaviors in order to make them aware of these actions. Stopping the repetition is not the aim. Service dogs help people with physical and mental disabilities. They are well-trained canines of any breed that have made the cut and can perform specific tasks that are customized for the person they will serve. They make the world a better place for all.